Ever since I first visited France with my parents I’ve been keenly aware of how unfriendly it can to those living on vegetarian/vegan diet. With this in mind, imagine how surprised I was to come across Have A Nice Karma, or Hank for short, tucked away on a little backstreet, peddling it’s meat free wares. 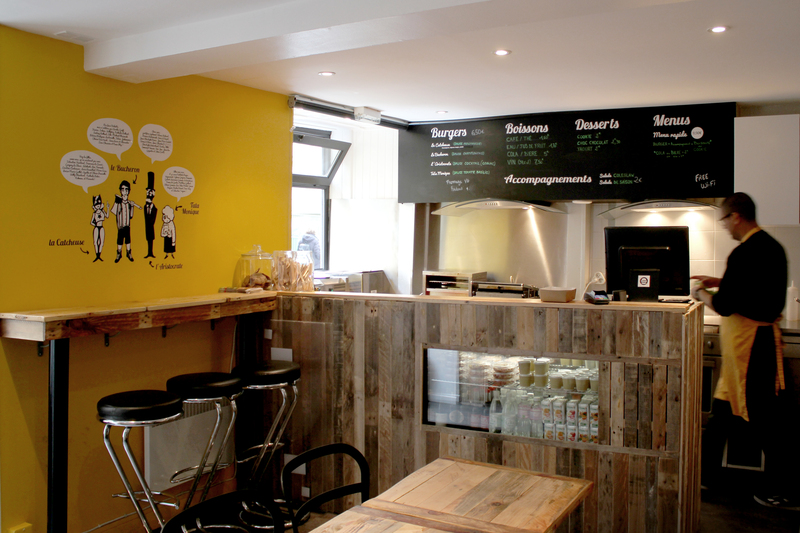 The Joint: 55 Rue Des Archives, 750 03, Paris, France. Keep your eyes peeled, blink and you’ll miss it! Familarise yourself with their website by clicking here. The Vibe: The phrase ‘hole in the wall’ is used way too often nowadays but there really is no other way to describe. It’s lucky that they offer a takeaway service as there’s only seating for ten inside the joint itself – eight at the short row of tables and two on the perch. Whilst this may be a turn off to some I found it charmingly cosy as a lone eater. Veganism has become a staple in the punk/emo subculture of the 2010’s and this is reflected in the staff – dispose of your uptight hippy stereotypes and accept that it’s been truly embraced by the young and trendy of today. Hank’s offers a small selection of four burgers, each with their own sauces and extra ingredients. 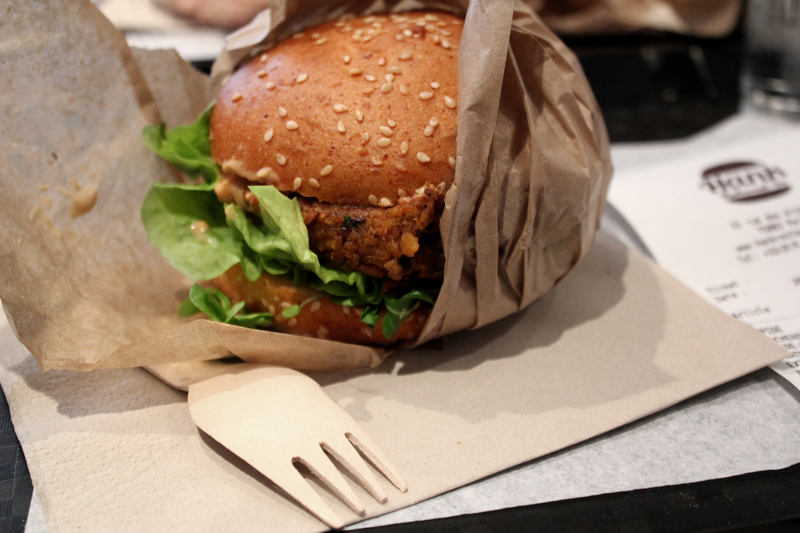 I went for the Le Petit Nerveux burger, drawn in by it’s offer of spicy coriander sauce and tortilla chips. I’m a firm believer in going all out at burger joints so we stuffed a thick chunk of soft vegan cheese in there as well, to top it all off. 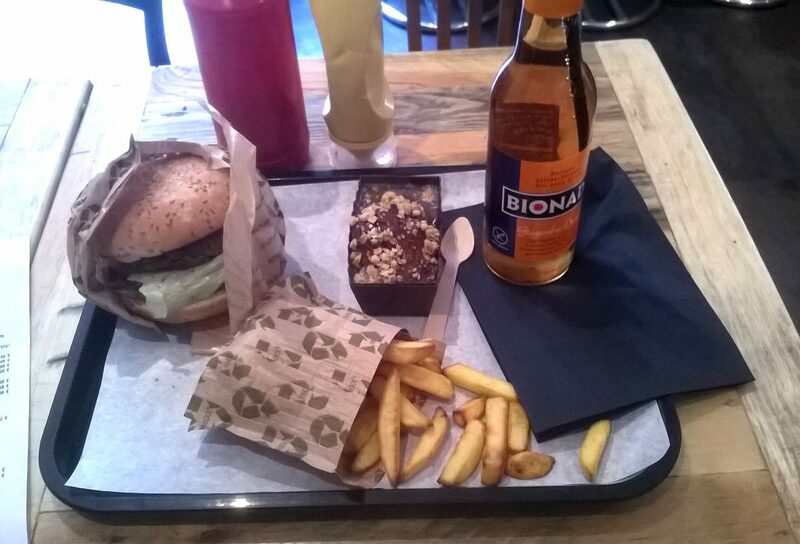 No burger is complete without fries and something to wash it all down with so I decided to pick up a bottle of locally brewed ginger and orange beer, along with a slice of carrot cake. So, this is the moment of truth – how did it fare? Every good burger comes served in a lightly toasted brioche and this is no exception, being sealed enough to hold the sauces at bay but soft enough to be enjoyable. The patty itself had a nutty aftertaste although it was a little dry, despite the best efforts of the green pesto and coriander sauce. It wasn’t enough to detract from the burger but it was certainly noticeable, being a big fan of The Black Heart’s (in Camden, London) wonderfully sloppy wares. The cheese itself was a delight, so creamy and soft, although the tortillas just weren’t noticeable. Much of the same could be said about the carrot cake – it was tasty but dry, although the citrus glaze-bordering-on-sauce helped it slide down a treat. The chips were similarly disappointing – there’s nothing wrong with oven chips but given the caliber of everything else it seemed a little lack lustre. 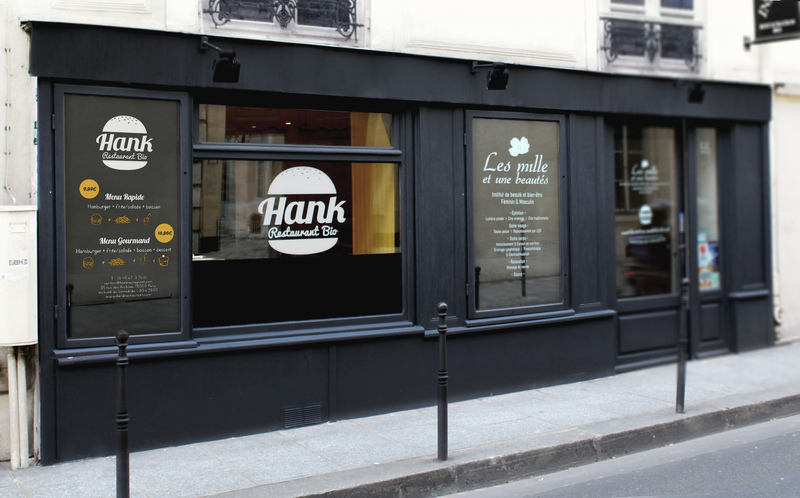 The Price: A meal at Hank’s will cost you between €12 and €16 on average, with mine weighing in at €14.50. There’s no denying that this is a little more than what I’d normally spend on a burger but it’s worth remembering that this is Paris – nothing is cheap here. Hank was visited by Richard in August 2014. Posted in ParisTagged BBQ, bionade, burger, Burgers, Food, france, Hank, paris, Parisians, Vegan, vegetarian, veggieBookmark the permalink.